The film is about a bygone culture of Russia of the late twentieth century. About people have not yet lost their conscience and dignity. Film-thinking about our future with you. 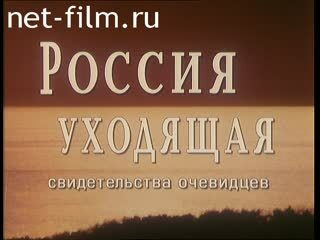 The film involved - writers V. Astafiev and G. Marquez, academics Abalkin and V. Likhachev, composer Rodion Shchedrin, artists R. Bykov, O. Tabakov, M. Mastroianni, M. Plisetskaya, R. Nureev., The audience will be acquainted with the modern hermit living on a desert island, he also will visit the first Church service in the famous Kizhi.